I know my birthday isn't for another 25 days but as you know, I celebrate it wayyyyy in advance and even for weeks after. So, during my recent visit to Manila, I decided to celebrate my birthday with both my side and Paul's side since we won't be home on the actual day.We stayed for a very short time only so I had a joint celebration with my dear niece, Julia. :) I just love my in-laws and I'm so glad that we were all complete that night. We didn't had a lot of time to prepare not even to go out and to buy food so thankfully, I met the cool guys behind Seven Comfort Cuisine who took care of our dinner line-up. All I had to do was to email them to inform how many we will be and to share some of our diet restrictions too. They are so quick to respond and they willingly suggested the dishes based on our specifications. So, that night, we had: Savory Chicken Mushroom Pasta (Php. 600 / Php. 1,000), Caramelized Peppered Pork (Php. 750 / Php. 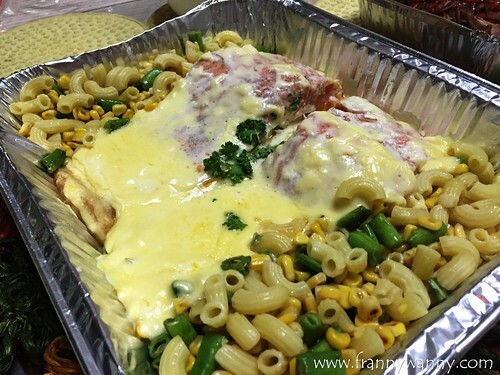 1,250) and Cheezy Salmon Bechamel (Php. 1,500 / Php. 2,500). Since there were 9 of us plus 3 kids, they suggested that we get the large sized trays which is good for 10-12 pax. The serving was very generous that we actu ally had so much left which we shared with our helpers too. 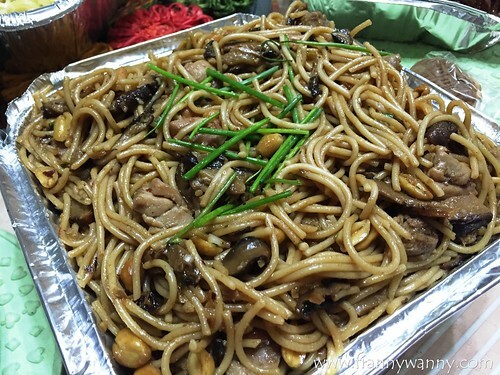 The Savory Chicken Mushroom Pasta reminded us of one famous Oriental-flavored pasta created by a pizza company. I love the al dente noodles and it has a delicious savory sauce with a slight spicy kick. 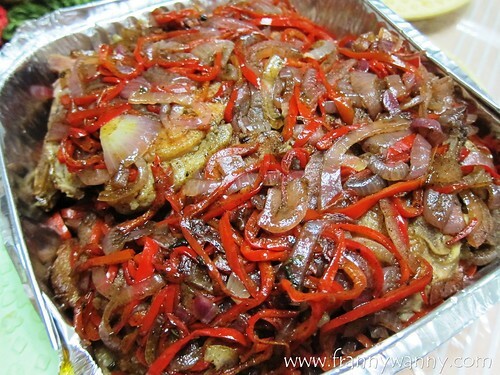 Just right to whet your appetite further but not too spicy to ruin the meal for you. It's packed with so much fillings such as mushrooms, chicken bits and yummy peanuts. I highly recommend this. Next, we had the Cheezy Salmon Bechamel which was a hit with the family! My only concern was that the salmon wasn't de-boned well so I actually bit into a couple of huge fish bones which is pretty scary since we got 3 little kids eating this too. Otherwise, the creamy bechamel was really yummy and even the pasta salad that came with it was pretty tasty too. Lastly, we had the Caramelized Peppered Pork. Admittedly, it doesn't looked very enticing but this is the perfect case of not judging a dish by its looks as the peppered pork turned out to be my favorite that night. It was sliced thinly and I love how tender the meat was. It has a nice balance of peppery and sweet flavor which I think would go so well with rice or mashed potatoes. Paul loved it too because it's fully loaded with onions and bell peppers which he said was a clear indication that they do not scrimp on their ingredients. For dessert, they sent over pots of Coffee Panna Cotta (Php. 70) which I have to say is the BOMB! It's actually one of the yummiest panna cottas that I've had ever and while I initially offered to share my pot with Paul, I ended up finishing most of it till I've polished the pot clean. In fact, it was so good, it totally slipped my mind to take a proper photo of it first. Oops! 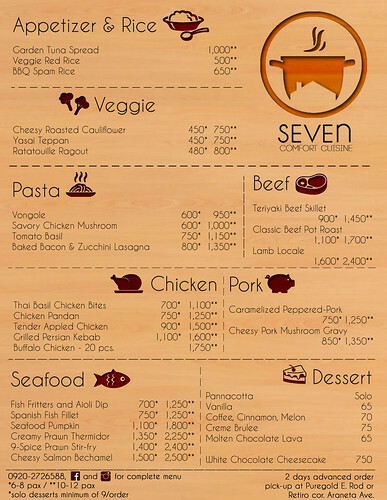 I'm glad that I learned about Seven Comfort Cuisine as they surely saved me from stressing out on planning for my early birthday celebration with the family. Now, ordering good food is as easy as sending an email or is just a quick SMS or call away. They also got more dishes that I can't wait to try next time. Check out Seven Comfort Cuisine on Facebook or Instagram. You may also drop them a line at 0920-2726588 to immediately contact them. Please give 2 days lead time for your orders.